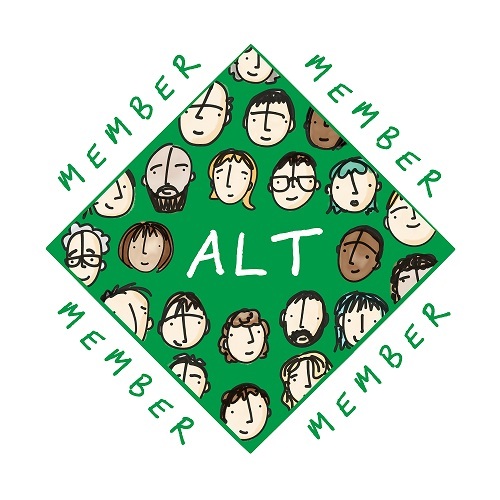 Each year, the Centre for Excellence in Learning and Teaching at Manchester Metropolitan University runs a one day learning and teaching conference to celebrate good practice and bring colleagues from across the university together to share ideas and network. This year, we decided to try something different. Instead of a one day event in one place, we organised a month long ‘Festival of Learning and Teaching’ with events run across our two university campuses. In the true spirit of a festival, we threw open the format; welcoming events of all kinds, lengths, and style. 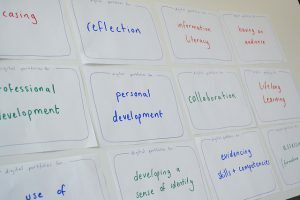 Colleagues from around the university were encouraged to submit their proposals to organise one or more of the events around any aspect of learning and teaching. We were impressed by the response and received over 70 proposals, leading to 50 separate themed events over the month of June. The festival format was new to us. It offered new exciting opportunities to explore learning and teaching from a wide range of perspectives using a variety of approaches such as off campus trips, exhibitions, drop-in sessions, digital skills workshops, and a game show-style event. 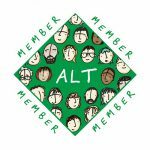 We felt that is was worth experimenting with an alternative approach to the traditional conference format for a few reasons. Firstly, as a large institution, at this time of year we struggle to find a day free of faculty conferences and departmental away days. We hoped that this distributed model would address this problem and give more colleagues the opportunity to attend at a time that suited them. Secondly, we like to change our conference each year to try new ideas. Last year, for example, we offered a ‘world café’ during our annual conference where delegates visited table presentations in round-robin style. This was seen as a valuable opportunity for networking and sharing of ideas more informally. The year before, we created an installation of colourful paper boats and invited colleagues to respond to the key questions of the conference. The use of technology for learning was a prominent theme on the festival programme. There was a good mixture of events. There were research presentations on using blogs in teaching, developing online adaptive learning, and using apps with students on placements and for game-based learning. We had demonstrations of VLE functions to foster online interaction, notetaking for students with dyslexia, and augmented reality. 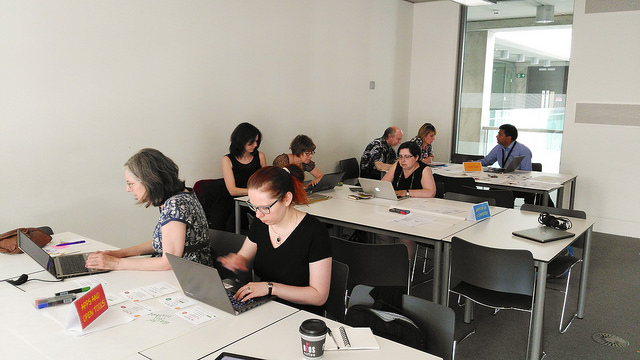 There were also practical workshops such as video editing to help colleagues develop digital confidence and capacity. The distributed nature of the festival allowed colleagues to follow specific themes throughout the month. We found delegates hopped from one event to the next, building both pedagogical knowledge and new technical skills. For example, delegates could attend a session on different applications and practices around the use of digital portfolios, and then participate in a practical workshop to help them create one from scratch the following week. This approach seemed to work well and encouraged colleagues to consider how they could develop in order to enhance and innovate with technology in their teaching. It was inspiring to hear about the application of technology from so many perspectives. Among those presenting we had lecturers, library staff, learning technologists, academic developers and support staff. Each of these roles afforded a different perspective on technology for learning and teaching. For instance, there is a technical level of understanding to using Nearpod, and then a pedagogical understanding needed to engage learners in lecturers with 200 students. Encouraging colleagues from such a wide variety of roles to present or facilitate brought this diversity to the table. The variety of technology-supported applications that were showcased was refreshing, also, and evidenced the creative approaches colleagues are using to enhance and transform the student experience. 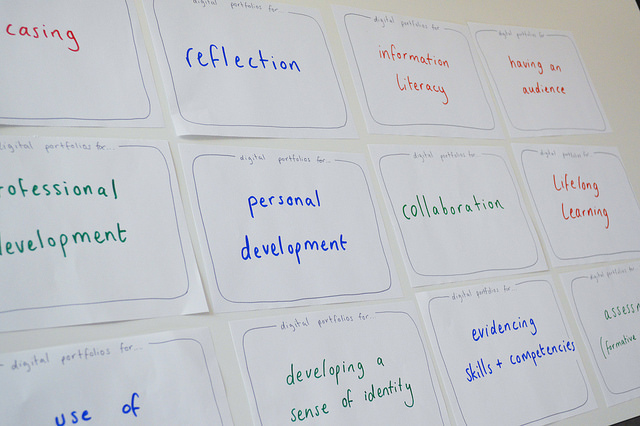 Photo from festival workshop ‘What use are digital portfolios? Throughout June, 277 colleagues participated in the festival. The sessions varied in size depending on the type; some as small as six, others as large as forty. Many delegates commented that they liked the flexibility the festival afforded them, and that the sessions had been engaging and valuable for their professional development. We are currently in the process of evaluating the festival. Feedback has been very positive, so we feel there is a lot of scope to develop this idea for next year. Many thanks to Santanu Vasant, Stephen Powell and Chrissi Nerantzi for their help with this article.